Nearly 500,000 people receive medical treatment for burn injuries each year in the United States, according to the American Burn Institute. Burn injuries can occur just about anywhere—in the home, on the job, on the road and elsewhere. Depending on the severity of the injuries, burn victims may require extensive and costly medical treatments, and live with significant scarring and disfigurement. Burn injuries can have a wide range of causes—from the sun to fire and even chemicals. However, regardless of the type of burn, if it was sustained as a result of another person's negligent or malicious actions, the victim may be eligible to file a civil personal injury lawsuit and pursue a monetary award for his injuries and other losses. The types of compensation sought in burn cases is similar to what one would expect in any personal injury case, although burn cases often have a heavy focus on non-economic damages, such as physical pain and suffering, scarring, permanent disfigurement, and emotional trauma. Additionally, due to the excruciating pain and permanent scarring associated with severe burns, burn injury cases tend to have a higher settlement value than other types of personal injury cases. If you were seriously burned in a negligence-related accident caused by someone else, the Delaware Injury Attorneys at Morris James Personal Injury Group may be able to help. Thermal burns. Caused by coming into contact with flames, steam, boiling water, hot objects, and even dry heat sources, thermal burns are the most commonly treated type of burn in the United States. These burns can cause severe blistering and scarring and are often sustained in fires and household accidents. Radiation burns. Most people have experienced a mild radiation burn in the form of a sunburn. However, the results of prolonged exposure to radiation can be anything but mild and may include severe skin redness, internal organ damage, and even cancerous tumors. Electrical burns. When a powerful electrical current comes into contact with the body, serious burns can result. While this type of burn can occur anywhere, it is particularly common in workplaces. Chemical burns. When caustic substances such as acid, bleach, ammonia, and products containing these and other harsh chemicals come into contact with the skin, they can cause significant damage. First-degree burns. Considered superficial, first-degree burns damage the top layer of skin, causing redness and blisters. These incredibly common burns can be treated at home and usually heal in a matter of days. Second-degree burns. Damaging both the first and second layers of skin, second-degree burns can be extremely painful and may result in fluid-filled blisters or even permanent scarring. Third-degree burns. Penetrating and damaging all layers of skin, third-degree burns may even affect muscles and blood vessels. These burns may char the skin and are often incredibly painful. However, in the most extreme cases, damaged nerve endings may result in numbness. Do You Need a Burn Injury Attorney? 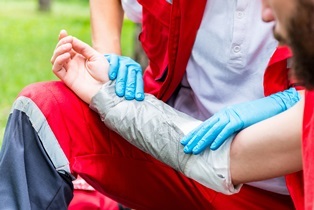 Serious burn injuries require intensive medical treatment and may prevent you from performing the duties of your job—keeping you out of work as you watch your medical bills mount. The Delaware Injury Attorneys at Morris James Personal Injury Group can help you fight for a fair financial award that compensates for both tangible monetary losses and non-economic damages, such as scarring, disfigurement, and pain and suffering. Contact the Morris James Personal Injury Group today to arrange a free initial consultation to discuss your potential burn injury case.